KANSAS CITY, Mo. (AP) The sight was oh-so-familiar to Chiefs fans: That familiar speed of Jamaal Charles hitting the hole, the talent that made him one of the NFL’s best running backs during nearly a decade in Kansas City. 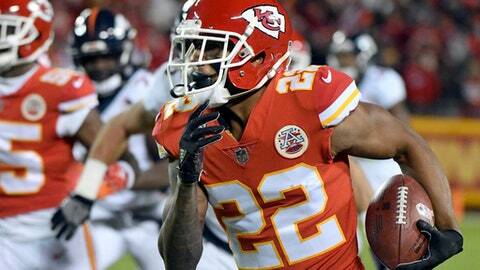 The fact that Marcus Peters picked up his strip of Charles, the first of five forced turnovers, and ran it 45 yards for a touchdown to open their 29-19 victory simply made it that much better. ”Well, we pride ourselves off of turnovers and sacks,” Chiefs linebacker Derrick Johnson said in a joyous locker room Monday night. The Chiefs didn’t force any turnovers the previous week against the Raiders, when they allowed Derek Carr to torch them for 417 yards passing and three touchdowns in a last-second 31-30 loss. They only forced one the previous week in a 19-13 loss to the Steelers. Chiefs coach Andy Reid said producing turnovers wasn’t a particular emphasis during the extra time between their Thursday night game in Oakland and their Monday night game against Denver. Rather, it’s a point of emphasis every day in practice – stripping ball-carriers and picking off passes. The Broncos’ second fumble came when rookie return man Isaiah McKenzie dropped a punt and the Chiefs jumped on it deep in their own territory. Kansas City turned it into a field goal moments later.